Conservative Felipe Calderon is acting more like Mexico's president-elect every day, preparing a transition team and announcing plans for a national tour despite efforts by his rival to overturn the election results. Calderon's presidential airs are infuriating leftist Andres Manuel Lopez Obrador, who says the July 2 presidential election was fixed and has presented Mexico's top electoral court with evidence, including videos, he says show vote fraud. "Nobody is going to accept a step back from democracy," Lopez Obrador said late Tuesday in an interview on Mexico's Televisa network. "I won the election, without a doubt." An official count last week gave Calderon a 0.6 percentage point margin of victory over Lopez Obrador, but the Federal Electoral Tribunal must still rule on the fraud allegations before the win is official. It has until Sept. 6 to decide. On Tuesday, Calderon asked campaign director Josefina Vazquez Mota to reach out to other political parties and help build a coalition government. He said that Vazquez Mota's deputy, Juan Camilo Mourino, would head his transition team. "We have begun working toward the transition between the administration headed by President Vicente Fox and the administration I will have the honor of leading starting Dec. 1," Calderon said. Lopez Obrador quickly criticized Calderon's move. "It's like trying to say, 'It's all over, I declare myself president,' completely illegally," he said. Fox, who belongs to Calderon's National Action Party, said he would not recognize a president-elect until the court had ruled on the challenge. "We all have to be very prudent," he said Tuesday in Panama at a meeting with Central American leaders. Calderon said he has spoken with governors from most of Mexico's 31 states since the July 2 election, and that his party would finance his nationwide tour to build unity in a country split between the poor south and the industrial north. He shrugged off fears his presence could provoke a violent reaction in Lopez Obrador strongholds. 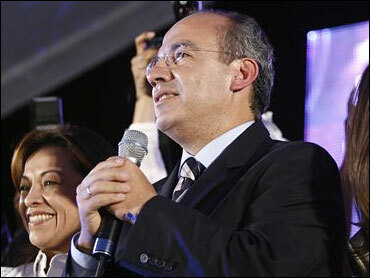 "I will tour the country, first in my role as winner of the election, which I won in part because of the votes of those states in the south," said Calderon, who spoke in front of a newly designed presidential-style logo featuring his name and the red, white and green of Mexico's flag. "I will build a climate of reconciliation." Lopez Obrador said his supporters would begin marching on the capital Wednesday, joining up for a huge demonstration in Mexico City on Sunday to demand a manual, ballot-by-ballot recount. Meanwhile, his legal team finished handing over boxes of videos, documents and recordings that it said showed that fraud and illegal campaigning had given Calderon a razor-thin advantage of fewer than 244,000 votes in the official count. Lopez Obrador presented a video Monday of a man allegedly stuffing a ballot box with votes. But electoral authorities said the tape actually showed a poll worker redepositing votes that had been placed in the incorrect box. He also presented two videos showing what he claimed were authorities illegally opening a ballot box, and electoral officials examining ballots that had been previously voided, most of them for Lopez Obrador, before finally determining they were legitimate votes. Lopez Obrador also claimed some of his Democratic Revolution Party's poll watchers were bribed not to denounce fraud, and criticized foreign observers who described the elections as clean. "They observed, but they didn't see," he said.